A Christmas Present Giveaway list wouldn't be complete without something lovely that's mainly for the ladies. Bee Good are a British company making gorgeous natural skincare using the honey, propolis and beeswax from our native bees. They use excellent quality ingredients in their skincare products, and you can really tell. 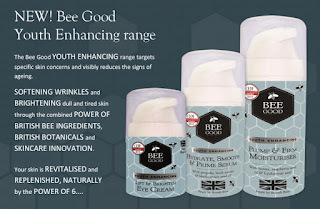 Bee Good have offered one of my readers their Youth Enhancing range. 3 products for the face which suit people of all skin types, but which are especially good for maturing skin. The Lift & Brighten Eye Cream lifts, tightens, reduces dark circles and visibly improves the signs of ageing - and it can also be applied to fine lines around the lips. The Hydrate, Smooth & Prime Serum is bursting with potent, natural ingredients which target the signs of ageing, improve the appearance of fine lines, even skin tone and hydrate. 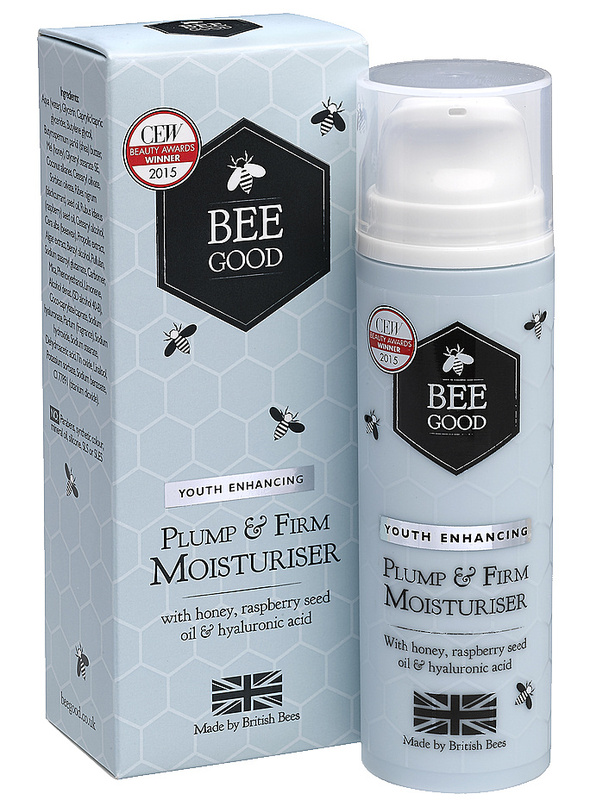 The Plump & Firm Moisturiser improves the visible signs of ageing and leave skin with a bee-autiful, youthful glow. I've reviewed and used a few Bee Good products now and I have found a couple that are now firm favourites. The Honey, Borage and Echium Intensive Hand Repair is the best hand cream I've ever used, and although it costs £12 for 50ml, you need such a tiny amount to make a massive difference that it last for months, not weeks. The Honey & Wild Flax Daily Moisturiser is a gorgeous face moisturiser that I love to carry with me in my bag at this time of year to dab politely onto my forehead and cheeks when I've been outside 'enjoying' the Manchester weather. Bee Good also have some nice gift boxes available this Christmas, and you can save on buying items individually. Find out more on the Bee Good website. 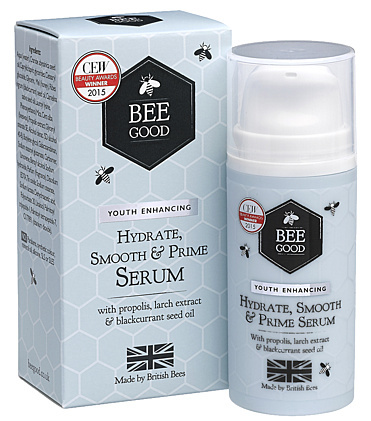 Bee Good will give one very lucky reader all 3 items in the Youth Enhancing Skin Care Range worth over £65. That's an excellent present for a special person in your life, or for yourself (because it's Christmas). Entry to the giveaway is by Gleam form below. No entry is mandatory, but every extra task you complete will earn you extra entries into the random draw. Gleam and I don't use your details for anything other than checking the winning entry and contacting the winner. For help with Gleam and to see my other Christmas Present Giveaways please go to my giveaways page. The giveaway will end at midnight November 30th. UK entries only. The lift & brighten eye cream. The Youth Enhancing Hydrate, Smooth & Prime Serum sounds appealing to me! Love the sound of the Honey & Wild Flax Daily Moisturiser. The raspberry and white chocolate lip balm sounds delicious- I may want to eat it rather than put it on my lips!!!!! I love the sound of the Honey & Camelina Facial Exfoliator! I love the yellow bottle too! I have really chapped lips so vanilla and honey lipbalm sounds lovely. I like the sound of the Honey and Propolis Cleanser. My mum says Propolis is great for mouth ulcers so I imagine it is good for skin as well, especially if it's angry and sore with acne. The honey, borage and echium intenstive hand cream sounds great. Love the sound of the Raspberry & White Chocolate Lip Balm, i could taste/smell chocolate without the lifetime on the hips! Love the sound of the Plump & Firm Moisturiser - both the name and what it does! I like the sound of the 'Bee Beautiful Gift Pack' - sounds needed! The Vanilla and Honey lipbalm sounds divine! Plump & Firm Moisturiser - need all the help I can get! The Raspberry & White Chocolate Lip Balm sounds so good! My choice is the Honey, Borage & Echium Intensive Hand Repair. I work outside 1 day per week, and my hands are constantly wet or covered in mud or muck, so they could do with a good repair cream. The Vanilla and honey lip balm sounds awesome. The Bee Beautiful gift pack looks great. I love the sound of these products - the Honey, Borage & Echium Intensive Hand Repair caught my eye though as my hands do get very dry in the winter. Thanks very much for the giveaway! he lift & brighten eye cream is just what I need! The youth enhancing serum - I need some! The Raspberry & White Chocolate Lip Balm, sounds lush. They all sound nice so I'd try the Be Pampered gift pack so I could try a few different things to see what I liked best. The Youth Enhancing Plump & Firm Moisturiser looks amazing. Elaine Skye Clark.....Vanilla and Honey lip balm sounds lush. Honey & Camelina Facial Exfoliator sounds yummy and just what I need at the moment. The vanilla and honey lipbalm is very appealing. I use Dermology Skin Brightener Cream for women. It is the best cream for women. I love the idea of Vanilla and honey lip balm. The Raspberry and White Chocolate lip balm! I'd love to try the Honey, Borage & Echium Intensive Hand Repair. My hands need all the help they can get, especially in this winter weather! the Honey & Crambe Daily Hand Cream sounds lovely! The honey and wild flax moisturiser sounds wonderful as do all three of the product's in the Bee Good range. My skin really needs lots of extra help because not only do I have mature skin but I live on the East coast. The wind and rain really dry my skin so although it's brilliant to live here in the summer this time of year is another story. I love products that have natural ingredients because I have sensitive skin and Really appreciated your revue. Thank you for a brilliant competition as the Bee Good range is now top of my Christmas wish list. I could definitely do with some of the youth enhancing plump & firm moisturiser in my life!! 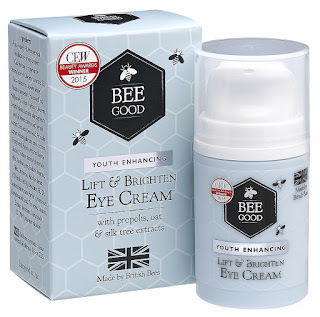 The Youth Enhancing Lift & Brighten Eye Cream. Vanilla and honey lipbalm sounds wonderful. The Honey, Borage & Echium Intensive Hand Repair, I have dreadfully dry hands. Hydrate, Smooth & Prime Serum - I think I need this in my life! Great range of products, all of them sound fabulous. The Honey & Crambe Daily Hand Cream - Duo Pack looks fab! http://beegood.co.uk/collections/all/products/lift-brighten-eye-cream - I really need to start using eye cream, denaying the age! The Honey and wild water mint 3in1 cleansing water sounds super! I definitely need the plump and firm moisturiser. Sounds fab. The lift and brighten eye cream as I have dark circles! Honey & Camelina Facial Exfoliator seem great! 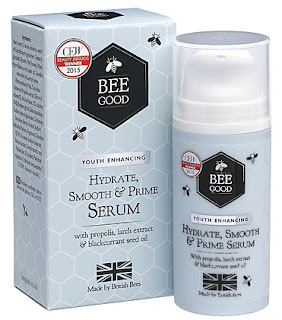 The Youth Enhancing Hydrate, Smooth & Prime Serum is one that sounds interesting and would love to try. Vanilla and honey lip balm sounds lush! The Honey & Wild Flax Daily Moisturiser sounds perfect to me and right up my street! The Youth Enhancing Hydrate, Smooth & Prime Serum sounds like the miracle I need.